This article is provided courtesy of Oregon Parks and Recreation Department. 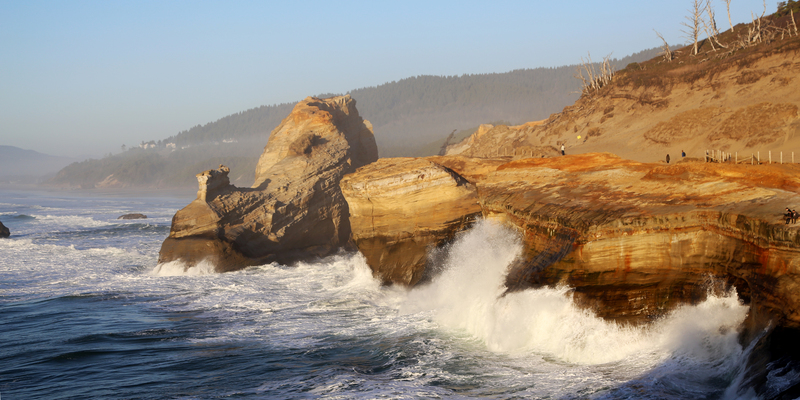 The majesty of Oregon’s coastline unfolds around every bend along the 382-mile Coast Trail. Hikers cross sandy beaches, meander through forest-shaded corridors and traverse majestic headlands. Most of the route is on the beach, although some segments wind through state parks or public lands. Generous landowners provide trail easements for portions of trail on private property. Please respect the rights of landowners by staying on the trail. Additionally, some trail segments are on the shoulders of U.S. 101, county roads and city streets. Please note: The trail route may change due to safety issues, road closures or detours. 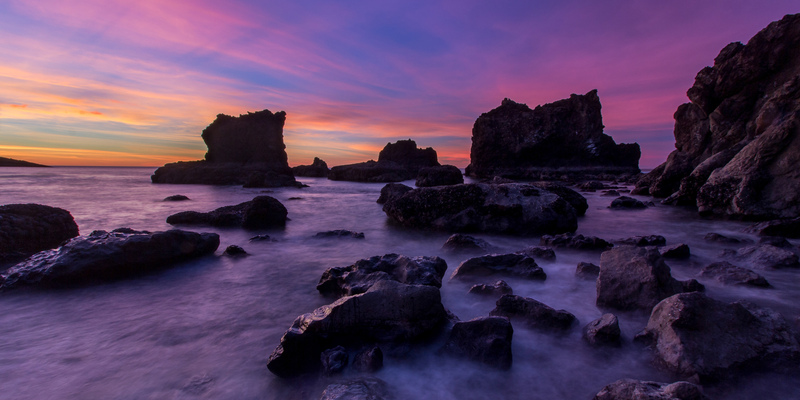 Colorful skies over the rocky coast of the hidden cove at Roads End State Recreation Site. Photo by Daniel Sherman. The Oregon Coast Trail begins its 382-mile route at the Columbia River south jetty. The trailhead is 4 miles north of Fort Stevens State Park Campground. The first 16 miles is on the beach between the south jetty and Gearhart. At Gearhart Ocean State Recreation Area, head east at the main beach access site on Pacific Way Street. Head south on Ocean Ave to E Street, and then head east on E Street. It will turn into Neacoxie Drive and finally turn onto G Street. Go south on Highway 101 to Seaside. Move west on 24th Avenue to Holiday Drive, then work south again. Follow 12th Avenue for beach access. Hike south on the beach toward Ecola State Park. Go inland and east to Sunset Boulevard. Follow Sunset Boulevard until you reach Ecola State Park’s north trailhead to hike on trail once more. Climb 2 miles to a viewpoint. Head south downhill to an overlook before descending to Indian Point and entering a parking lot. The trail continues to Ecola Point from the parking lot. The Seaside Trailhead to Hiker Camp is approximately 4 miles from this point. Hiker Camp at the top offers three small Adirondack-style shelters for overnight use. From Indian Beach, it is approximately 1.5 miles, and the same distance again to Ecola Point. Take the trail from Ecola parking lot about 1 mile to Ecola Road. Follow the Ecola State Park entrance road to a stop sign. From the stop sign, head east on 5th Street. Head south on Elm Street into Cannon Beach, taking the first right turn past the bridge and access beach. Follow the beach to Arch Cape. Silver Point, Humbug Point and Hug Point headlands can be passed at low tide in the summer. Just north of Arch Cape Creek, leave the beach and head east on Mill Road. Cross Highway 101 and continue on Mill Road. Go south for approximately a third of a mile and cross Arch Cape Creek on a pedestrian suspension bridge. Bear left at a trail junction and climb over Arch Cape to Highway 101. Cross Highway 101 once more and return to the trail. Hike approximately 3.5 miles to Cape Falcon, then on to Oswald West State Park. In Oswald West State Park, the trail continues at the southeast corner of the picnic area. Cross Short Sand Creek and hike up the hill, keeping left at the fork. Cross Highway 101 and begin climbing Neahkahnie Mountain. Pass the relay station, descend to a gravel road, and turn south to Highway 101. Follow Highway 101 to Nehalem Road. Hike to Nehalem Bay State Park and return to the beach. For an alternate route, follow Highway 101 through Nehalem and Wheeler to Manhattan Beach State Recreation Site. Jetty Fishery, which can be reached at 503.368.5746, provides ferry service across Nehalem Bay. Hike to Barview County Park and return by the park road to Highway 101 at the north jetty of Tillamook Bay. Continue south on Highway 101 through Garibaldi to Tillamook. Follow the signs to “Three Capes Scenic Highway.” In Tillamook, turn west on Third Street/Netarts Highway. 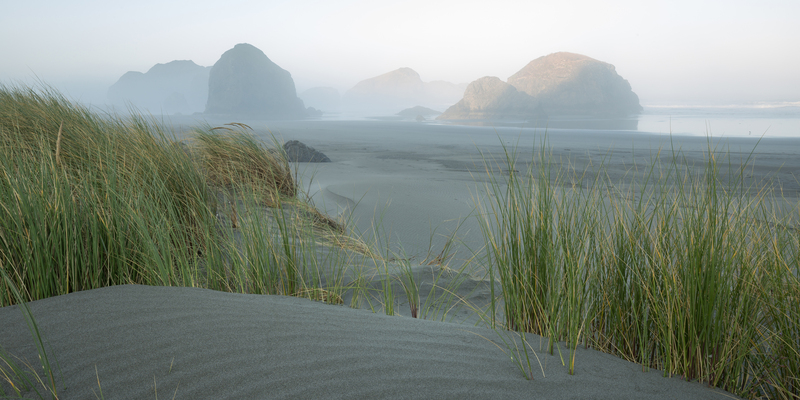 Once in Cape Meares, return to the Oregon Coast Trail at the end of 5th Street. Hike to the top of the Cape. At the southeast end of the parking lot, take the Octopus Tree trail out to the highway. Return to Three Capes highway, and hike to Oceanside. Return to the beach and continue to Netarts. Follow signs to Cape Lookout State Park. The trail resumes at the park. Ascend to the top of Cape Lookout, near a large parking lot. Head west on the Cape Lookout trail. Take a hard left and descend to the beach. Go to the mouth of Sand Lake. The outlet can be forded at low tide in the summer. For an alternate route, hike out Galloway Road to the Three Capes highway to Tierra del Mar. Return to the beach and hike over Cape Kiwanda. Just past Pacific City, at Pacific Avenue Beach access, leave the beach and head east toward to Highway 101. Head south to Winema Beach and then take Winema Road to the beach. Hiking at low tide is highly recommended here. Hike to Neskowin, returning to Highway 101 at Neskowin State Wayside. Return to the trail at Falls Creek Trailhead, approximately 1 mile. From Three Rocks Road Trailhead, head south to Highway 101. Walk along Highway 101 south to Lincoln City. Then head west on NW 39th Street. Return to the beach at this point. Hike on the beach to the mouth of the Siletz River, and then to Highway 101. Smelt Sands State Park. Photo by Tyson Gillard. Head south on Highway 101 to Wester Street and to Glenden Beach State Park. Return to the beach here. At Fishing Rock State Recreation Site, hike up and over the point to Fogerty Street. Head south to Highway 101 and follow it to Otter Crest Loop Road. Return to the beach at Devil’s Punch Bowl State Park. Hike past Beverly Beach to just short of Yaquina Head, before making use of beach access to head east to 62nd Avenue and onto Highway 101. 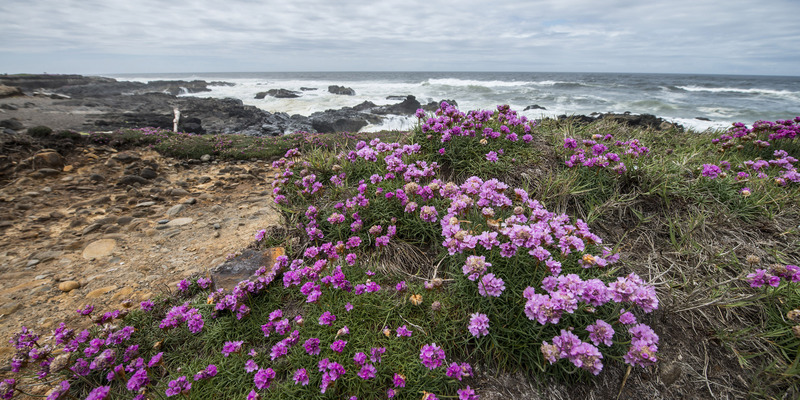 Go south and follow signs to Yaquina Head Lighthouse, returning to the beach. At Yaquina Bay State Park, head east to Highway 101. Cross Yaquina Bay Bridge and follow signs to the Hatfield Marine Science Center. Take the steps onto the bridge to Jetty Road. Return to the beach at the south jetty. Follow the beach from the south jetty to Beaver Creek (Ona Beach State Park). If not passable, hike east to a pedestrian bridge over Beaver Creek and return to beach. Just south of Seal Rock, return to Highway 101. Rocks may be crossed at low tide. Go south on Highway 101 for about 1 mile and return to the beach at Collins Creek State Recreation Site. Hike on the beach to the Bayshore Beach Club. Hike east on Westward Street and then hike north on Bayshore Drive. Head south on Highway 101 to cross Alsea Bay Bridge to Waldport. Exit Highway 101 at Alsea Bay Bridge Interpretive Bridge Center and return to the beach. At high tide, follow Maple Street to Highway 101. Return to the beach on the south end of the sea wall. Follow the beach to a headland just north of Yachats. Follow the 804 Trail through Smelt Sands State Wayside. The 804 Trail crosses Adobe’s front lawn and goes east to access Ocean View Drive to get to Highway 101. At low water, there is potential fording of the Yachats River. For an alternate route, cross Yachats River Bridge to Yachats Ocean Road and Yachats State Park. 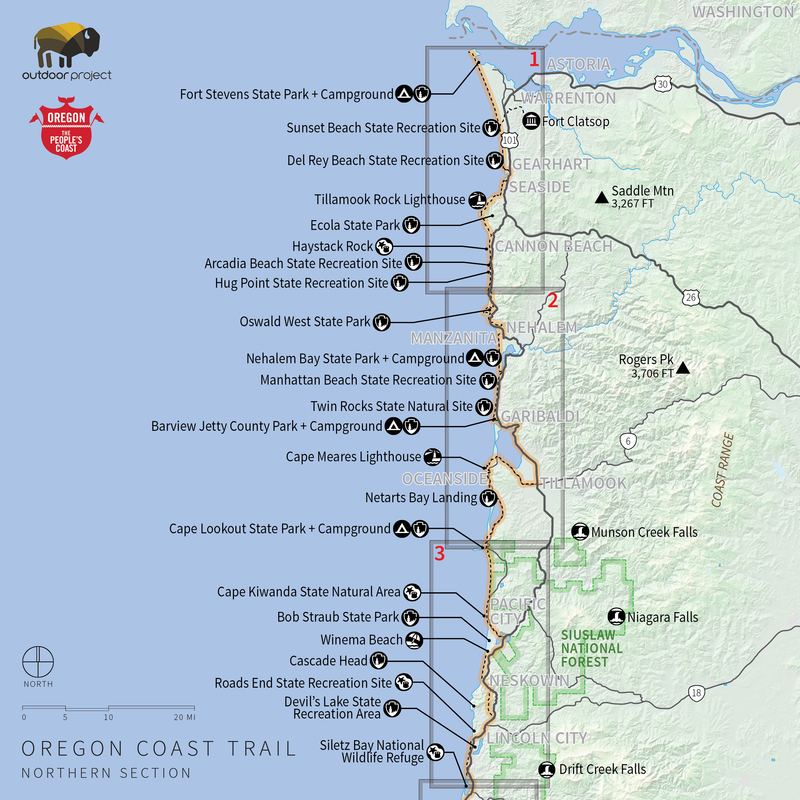 Return to Highway 101 and look for the Oregon Coast Trail sign approximately an eight mile on the east side of Hwy 101. Follow Amanda’s Trail/Coast Trail up the headland to Cape Perpetua. The trail descends down to the visitor center from here. Go to Gwynn Creek in Neptune State Park before returning to Highway 101. Head south on Highway 101 to find the trail from Carl Washburne State Park towards the beach. The Hobbit Trail/Oregon Coast Trail winds through the park to Heceta Head Lighthouse. Descend to a parking lot and head south on Highway 101. Just north of Lilly Lake, take the beach access trail to the beach and hike along the outflow of Lilly Lake to the ocean. Stay on the beach to Three Mile Creek beach access. Head east on Sparrow Park Road/County Road 247 just north of the Umpqua River to Highway 101. Stay on the beach to Three Mile Creek beach access. Head east on Sparrow Park Road/County Road 247 just north of the Umpqua River to Highway 101. Head south on Highway 101 through Reedsport. At Winchester Bay, head west on Salmon Harbor Road/ County Road 251 to South Jetty. Return to the beach and head south. Morning views along the beach at Myers Creek Beach. Photo by Patrick Mueller. At Horsfall Beach, leave the beach and hike Horsfall Beach Access Road east to Highway 101. Cross McCollough Bridge to North Bend. Follow the signs to “State Parks and Charleston.” Head west on Virginia Street and then south on Broadway Street. Turn west on Newmark Avenue to Empire. Go south on Cape Arago Highway toward Charleston. Through-hikers will take Seven Devils Road south. Here, there is a dead-end section of trail, as a small section of the trail goes north on Boat Basin Road, then heads southwest on Coos Head Road to Bastendorff Beach. A trail will take you back up to Cape Arago Highway to Sunset Bay State Park. Follow the trail on the south side of the bay to Shore Acres State Park and then to Cape Arago. After approximately 6 miles, Seven Devil’s Road turns to gravel at the junction of Beaver Hill Road. Return to the beach at Seven Devils Wayside. Five Mile Point is passable at low tide in the summer. For an alternate route, approximately 2.5 miles leads around the point to the Whiskey Run beach access. 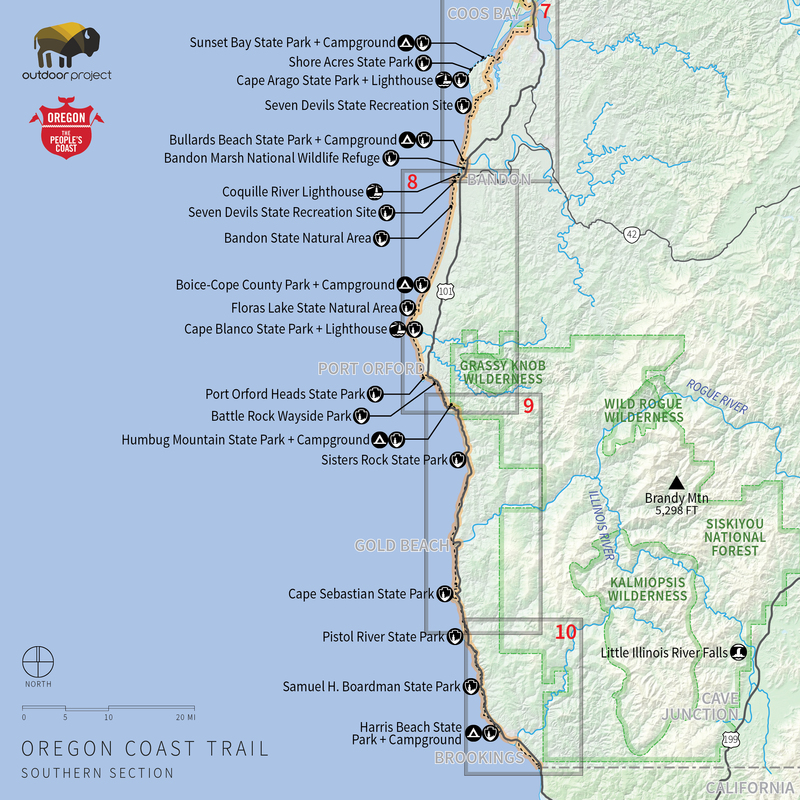 At Bullards Beach State Park, follow trails back to Highway 101. Cross the Coquille River Bridge and head southwest on Riverside Drive. Go west on 1st Street in Old Town Bandon, then take Jetty Road to Coquille River South Jetty County Park. Return to the beach here. Four Mile Creek and New River may be passed at low water in the summer. Look for the Oregon Coast Trail sign south of Floras Lake. Follow the trail over Blacklock Point to Sixes River. Cross here at low tide. Go to the Cape Blanco Campground. At the south end of the campground, follow a road down to the beach. The Elk River may be passed at low tide in the summer. At Tseriadun State Recreation Area, take the beach access up to California Street, then take 12th Street east to Arizona Street. From Arizona Street, go south to 9th Street. Take 9th Street to Highway 101. Head south on Jackson Street and return to the beach at Battle Rock. Just before Rocky Point, use the beach access to return to Highway 101. From Rocky Point, cross Highway 101 and go up a side road (Old Highway 101). Keep right, go through a gate, and descend to Humbug Mountain State Park. Take the day use trail back to Highway 101, then take Highway 101 to Euchre Creek. At Euchre Creek, hike along the beach to Nesika Beach. Take the beach access right after Highway 101 begins to veer away from beach. Follow Nesika Beach Road south until it connects with Highway 101. Return to Highway 101 once more. Take the Old Coast Road west to Otter Point Wayside. From there, follow signs to the beach. Hike the beach to Rogue River North Jetty. Hike east to Wedderburn Road back to Highway 101 and cross the Rogue River Bridge. Head southwest on Harbor Way. Take the South Jetty Road back to the beach. Before Cape Sebastian, take the trail to the top of Cape Sebastian State Park to a parking lot, then hike down the trail to the beach. Just south of Pistol River, take the beach access back to Highway 101 and head south. As you enter the Samuel H. Boardman State Scenic Corridor, look for the trail on the west side of the highway. 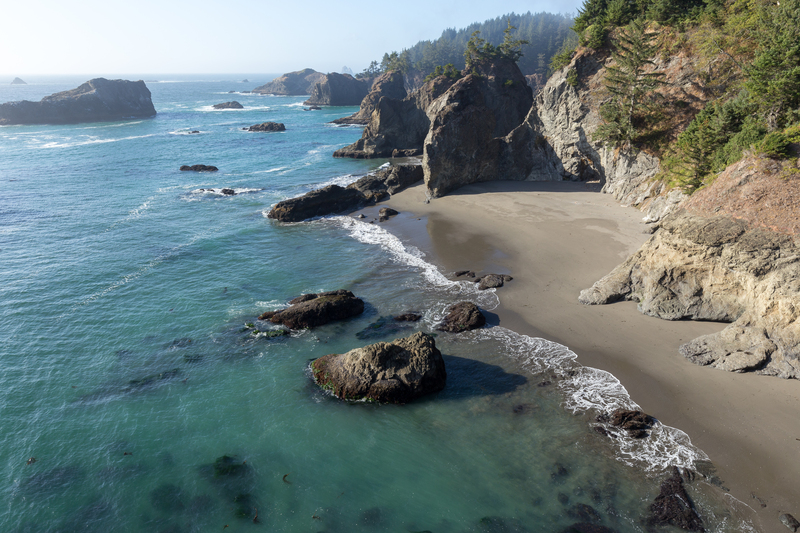 Through Samuel H. Boardman State Scenic Corridor, the trail parallels Highway 101. Return to Highway 101 at the end of Samuel H. Boardman State Scenic Corridor. Take Old Highway 101 into the north end of Harris Beach State Park. Follow the Sunset Point Trail to the bike path. The bike path will lead back to Highway 101. Take Highway 101 through Brookings to Chetco Bridge. On the south end of the bridge, head southwest on Lower Harbor Road. Just past the harbor, as the road heads uphill, take Oceanview Drive south. Oceanview will connect back to Highway 101 near Winchuck River. Take Highway 101 to just north of the Winchuck River. Head west on the beach access road to the beach. South of Winchuck River is Crissey Fields State Park. The end of Crissey Field State Recreation Site is the California state line and the end of the trail. A backcountry campsite on the Bayocean Peninsula. Photo by Tyson Gillard. 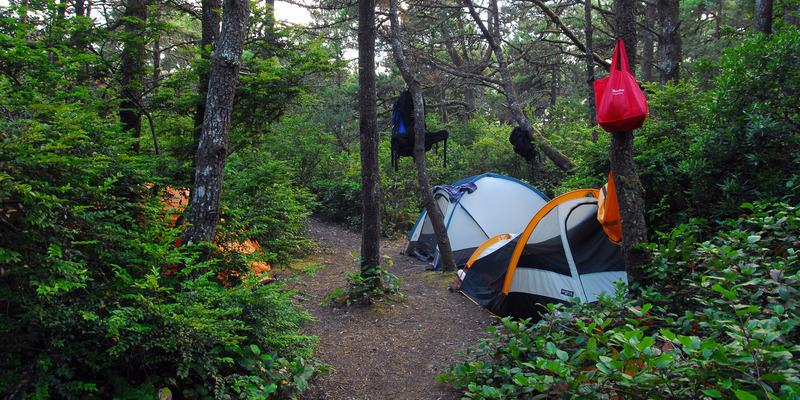 Almost every coastal state park campground has hiker/biker sites. The tent sites are first-come, first-served and are near water, restrooms and showers. Beach camping is restricted within city limits, state park boundaries, and near snowy plover habitat areas (avoid orange fenced areas during nesting). Fires are not allowed upwind or near driftwood piles. 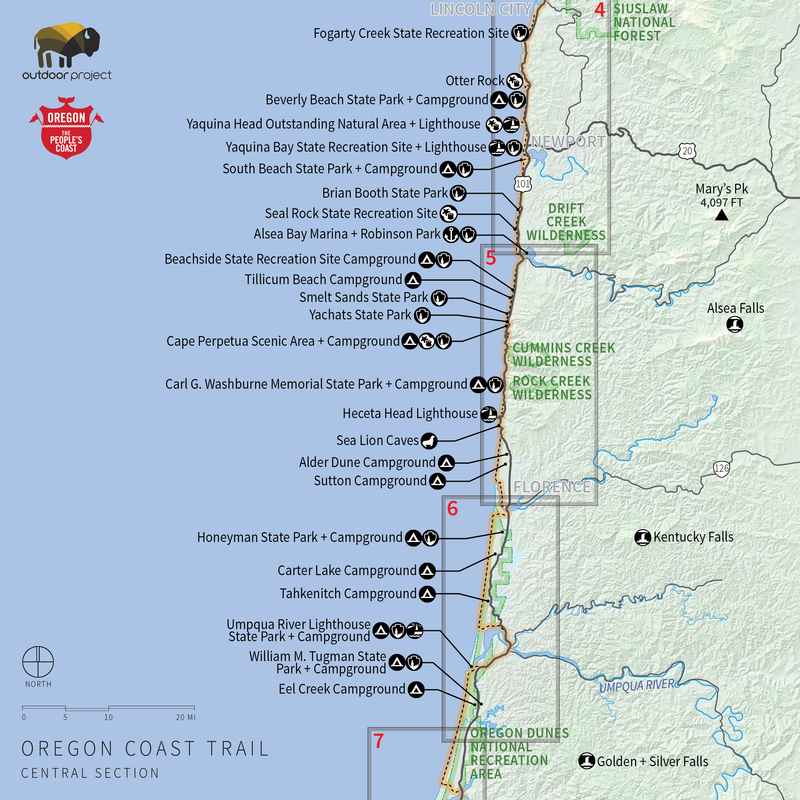 Please note: From March 15 through September 15 (the nesting season of the western snowy plover), some recreation activities may be restricted on sections of the Oregon Coast Trail. Watch for signs, and check for more information. Know the tides, as incoming tides isolate rocks from headlands and the shore. Do not walk out to rocks without knowing when the tide will roll in. Free tide tables are available at state park offices, information centers and many shops and motels. Tide information is also available at the Hatfield Marine Science Center website, and beach safety tips are available here. Waves rolling into Cape Kiwanda. Photo by Shane Kucera.